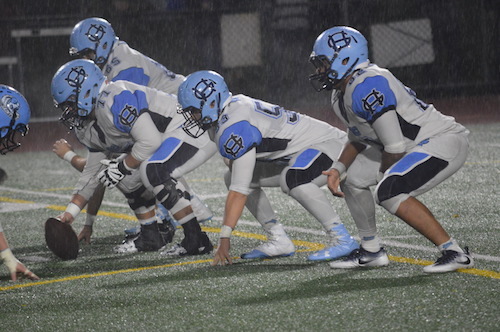 A late Saturday afternoon with unrelenting rain at Interlake High School was the scene for an opening round playoff matchup between the host Saints and visiting Gig Harbor Tides. Interlake was ready to defend their home field at the onset as their first play from scrimmage was a flea flicker to put them within striking distance. Moments later, Duncan Varela found Micheal Veliyev behind the Tide secondary for the opening score of the game from 31 yards out. A minute later, Veliyev picked off Nick Yockey’s pass and the Saints were in business. In the closing seconds of the first quarter, Varelia connected with Charlie Galanti to put Interlake up by 13. The Tides were reeling. Needing a successful drive, the Gig Harbor put together a series of plays which eventually placed them in striking distance for their first points of the game; a fake handoff by Ben Hollenbeck which allowed the Tide quarterback to trot into the endzone untouched. Feeding off the momentum swing, Gig Harbor came up with a fumble by the Saints and before the half concluded grabbed a one-point lead when Martin Brazier punched it in from 2 yards out. When play resumed, so did the rain and a flurry of turnovers created a game which saw few legitimate scoring opportunities. The score remained 14-13 and the clock was winding down. In the final two minutes of the contest, Interlake had the ball on the Gig Harbor side of the field and were driving. Varela was able to move the sticks a number of times to retain fresh sets of downs. The Interlake quarterback tucked the ball and was endzone bound, but the ball came loose and the Tide defense jumped on it within their own 5 yard line. Utilizing timeouts effectively, Interlake was able to stop the Tides from running the clock dry and had one last gasp effort. However, Cole Workman hauled in a late interception to put the game on ice. Gig Harbor moves on in the 3A state playoffs, Interlake concludes their season. Gig Harbor 14, Interlake 13. Join us as Steve Dion talks with Gig Harbor’s Coach Aaron Chantler about the “weird coincidence” that the top 3 teams in Narrows 4A all play each other in the final 3 weeks of the season. Why does Coach Chantler feel his Tides can defeat Olympia and Bellarmine Prep for the top spot? Gig Harbor’s high scoring offense has averaged 44 points a game and only allowed an average 12 points a game, respectively. Coach Chantler and his staff are impressed with great play from QB Davis Alexander, along with WR’s Santana Johnson, Bobby Blaser, Dylan Lindmark and Noah Samsen. In the consolation bracket of the District 3/4 tournament, the Battle Ground Tigers were set to take on the Tides of Gig Harbor. BGHS fell to Federal Way in the opening round on Thursday by the score of 82-58. GHHS was defeated by Beamer 67-54 in the opening round as well. In this loser-out contest, the possibility of finishing up to sixth place in the district tourney was still up for grabs by these unfamiliar opponents. The bulk of early shots by the Tigers were launched by Devin Johnson and Jamie Ford. The forward/guard duo was an integral factor in the outcome of the game and provided solid offensive output despite some difficulty finding consistent rhythm. After the teams were knotted at 14 apiece following the first quarter break, the court began to open up. Each squad was flying up and down the court, but it took until the final minutes before the half to reach the twenties when a string of shots fell for both sides. After sixteen minutes of play tied at 26 apiece, the contest was right as it started. Battle Ground’s strong perimeter defense covered their offensive struggles as the Tigers were 8 of 26 field goals. The intensity naturally grew in the second half as the reality that one team’s season would be coming to an end clearly resonated on the court. The first offensive possession for Gig Harbor was an And-1 by Casey Gearhart off an offensive board. The junior played big for the Tides on both ends of the floor including a team-high 16 points. But Johnson from the Tigers gave GHHS trouble on the low block throughout as the strong 6’6” junior plays a traditional “back-to-the-hoop” post game. Trailing by nearly double digits down the stretch, Gig Harbor needed buckets. Chris Drake, Chad Glover, and Sam Lovrak rose to the challenge. The Tide trio buried six from downtown in the final minutes to keep the game within reach. However, the Tigers were automatic from the free-throw line as they kept the Tides from stealing the game late. Battle Ground’s 21 of 29 from the charity stripe was the difference in the game and they move on in the tournament. The Tides season is over. Final score 65 to 61.